How do people communicate their romantic feelings? Gift giving is one way. Giving and receiving of gifts is a characteristic of intimate relationships. Gifts are a message, a form of communication with a tangible material object, about love, affection, or concern for the recipient. The "romantic gift" evokes a multitude of intertwined meanings: passion, intimacy, affection, persuasion, care, celebration, altruism, and nostalgia. They can also connote the negative images of obligation and reciprocity. 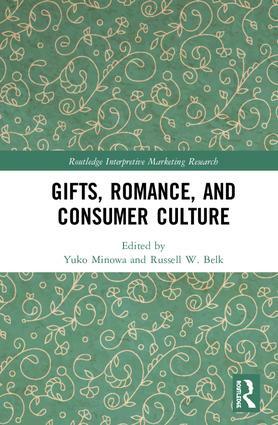 Romantic gift giving may be practiced at rituals, during rites of passage, or for casual occasions, to affirm the continued importance of the romantic relationship. We may even romanticize the giving of gifts to the self, to nonhuman companions, and to others we do not know personally. If loving and giving are a practice, then romantic gift giving is a practice of loving with intimate—or would-be intimate—others. Yuko Minowa is a Professor of Marketing at Long Island University, USA. Russell W. Belk is a Professor of Marketing at Schulich School of Business, York University, Canada.